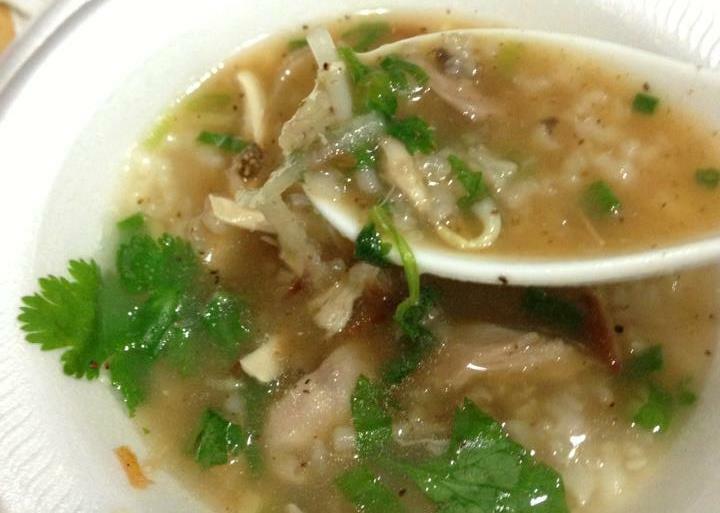 Chao Ga (Rice Porridge with Chicken) | Just Cuc It! I’m fortunate to have a “somebody” who is willing to hang out with you while you look and feel like crap! Thanks Josh 🙂 you rock my socks off! I have to give the title of best Chao to my cousin, Yen Lam. Hands down, she makes the best soup in the family! Well here is MY recipe. It’s really simple, only a few ingredients. I hope you’ll give it a try! In a separate saute pan, add a tsp of sesame oil, a couple of drops of olive oil, minced garlic and the cleaned and rinsed rice. *Here is my secret CUCing strategy. I add the julienned ginger at this point because I’ve found that when ginger is heated like this, the smell and flavor is enhanced* In most of my Asian stir fry recipes that call for ginger, I always add the ginger in the beginning when sauteeing the garlic with oil! Add the julienned ginger, a tsp of cracked black pepper, a few dashes of onion powder, garlic powder, 2-3 tbsp of fish sauce and cover. Stir every so often but keep the pot covered. Use a fork to pierce the chicken to check for done-ness. Fork should pierce easily through the meat and no blood should be present in the juices. Once it is cooked, remove the chicken from the pot and turn the heat to LOW immediately. Cover to let the rice continue to break down. Once the chicken has cooled, shred the chicken. I like to shred into small bite size pieces and add back to the pot; some people like to chop the chicken into bigger pieces bone and all and serve alongside the chao. Season the chao to your liking. I tend to add more black pepper and a few drops of fish sauce it is not flavorful enough at this point. The chao will need to cook about 20-30 more minutes to break down to the consistency that I prefer. 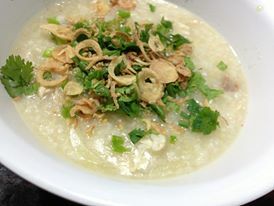 It’s a rice porridge, so it should be just the right thickness when ready. In a separate saute pan, add a tsp of sesame oil, a couple of drops of olive oil, minced garlic and the cleaned and rinsed rice. *Here is my secret CUCing strategy. I add the julienned ginger at this point because I've found that when ginger is heated like this, the smell and flavor is enhanced* In most of my Asian stir fry recipes that call for ginger, I always add the ginger in the beginning when sauteeing the garlic with oil! The chao will need to cook about 20-30 more minutes to break down to the consistency that I prefer. It's a rice porridge, so it should be just the right thickness when ready. Came across your recipe via google. Just made it, and it tastes great. What a simple recipe! I tried so many and yours is the BEST! Cooked it in rice cooker that has a slow cook option. Thank you for sharing. I have 2 little kiddos. One is sick and this is the perfect recipe. Awesome! I’m so glad you enjoyed the recipe! Thank you for trusting me 🙂 Happy Cooking! Wow! Such a simple recipe to make (even for this novice momma chef) and it tasted DELICIOUS! Both my sick husband and toddler approved. I loved it too and had to go for a second bowl. Thank you! Looking forward to trying your other recipes.